What Does Ethiopian Merger Mean for Africa's Aviation Sector? Can Ethiopian Cargo Unravel Logistic Bottleneck in Africa? Ethiopia Airlines possess unique, rare and difficult to imitate attributes that distinguish it from its peers in Africa. The airline is seen as the most successful airline in the continent. The airline is the example of how a government should allow its businesses to run without interference. Although Ethiopia Airlines is a national carrier owned 100 percent by government of Ethiopia, it is fully autonomous. In other parts of Africa and beyond, interferences contributed to the extinction of many airlines established during or before the independence of most African states. Such airlines that died due to the failure of government to stay away from their operations included the Nigeria Airways Limited, Air Afrique, Ghana Airways, Gambia Airlines, Air Angol, Botswana Airlines, Congo Airlines, Air Djibouti among others. These airlines were not professionally run like today's Ethiopia Airlines and, ironically, the defunct Nigeria Airways Limited, according to industry experts, had more prospects than any other African airline. In the 1990s the airline was doing about 202 fights weekly. Even during the politically undulating fortunes of Ethiopia, its airline held sway, it burrowed through the challenges of the failed experiment on communism when Ethiopian government started a romance with Russia and China in the 1970s and wanted Ethiopia Airlines to re-fleet, exchanging its US made aircraft with that of Russia. But subtly, the management of the airline reminded the government then that this would mean replacing the whole training facilities, including maintenance, spares and even the retraining of personnel, a challenge that would pose huge fiscal sacrifice to the airline and the state. The idea was dropped. Ethiopia Airlines was established on December 21, 1945 and it started operation on April 8, 1946. From the onset it was determined to succeed and to become a dominant airline in Africa. It was one of the first airlines in the continent that developed its maintenance infrastructure and started comprehensive training of pilots, engineers and cabin crew. According to reports, the airline was featured by The Economist as an example of excellence in late 1987 and economist Paul B. Henze recognised it in 2000 as being "one of the most reliable and profitable airlines in the Third World" In July 2011, Ethiopian was named Africa's most profitable airline for the year 2010 by Air Transport World, and it has also been praised by African Airlines Association (AFRAA) for its sustained profitability over recent years. In addition to earning from ticket sales, Ethiopian generates revenues by providing aircraft maintenance to foreign airlines, and specialist training for both Ethiopian and foreign trainees. Every year, pilots and technicians graduate from both the Pilot School, inaugurated in 1964, and the Aviation Maintenance Technician School, established in 1967. FAA accredited the airline's maintenance division. 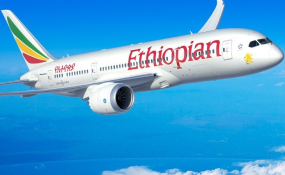 Manager of Ethiopia Airlines Holidays, Seble Wongel Azene said the airline started "Vision 2010" in 2005, which aimed to increase passenger traffic to three million, revenue to $1 billion and employees to 6,000 by 2010. By the year 2010 Ethiopian had exceeded all goals set in "Vision 2010", and the company's net profit for the fiscal year ended 2010-6-30 was $121.4 million. The results were attributed in part to an aggressive marketing campaign and major cost cutting measures. As at July 2017, Ethiopia Airlines has 92 aircraft but in its 2025 projection it plans to generate $10 billion revenue, operate 120 international destinations and 26 domestic detonations, deliver 140 aircraft, airlift 22 million passengers and haul 820, 000 tons of cargo.